Four years ago (back in 2010), Lisa Leake and her family of four went 100 days without processed food on a small budget. That experience led to her creation of a very popular blog and a bestselling book, 100 Days of Real Food: How We Did It, What We Learned, and 100 Easy, Wholesome Recipes Your Family Will Love. Leake’s blog provides support, motivation and recipes for anyone who adopts the very doable New Year’s resolution of no processed foods for 100 days. And if this resolution seems too challenging, guidance to meet a ten day pledge of no processed foods is available on Lisa Leake’s blog and can be the basis of a very manageable New Year’s resolution. Defining the meaning of “real food,” as distinct from “processed foods,” is at the heart of Michael Pollan’s Food Rules, a book worth studying. Lisa Leake further simplifies Pollan’s rules, with her suggested plan of action. Her summary of “the exact rules we followed during our 2010 pledge” of no processed foods for 100 days consisted of these seven basic rules: (1) No refined grains, only 100% whole grain; (2) No refined or artificial sweeteners, only honey and pure maple syrup; (3) Nothing out of package that contains more than five ingredients, (4) No factory-farmed meat, only locally raised meat products; (5) No deep-fried foods; (6) No fast food; (7) Beverages only to include water, milk, occasional all-nautral juices, coffee and tea, and wine and beer in moderation. 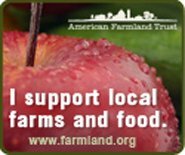 Another very doable New Year’s resolution, which fine tunes a commitment to avoid processed food, is to join a community supported agriculture farm (CSA farm). In addition to avoiding processed foods, a shareholder in a CSA commits to eating with the seasons and becomes a part of a small community that supports a particular farm family. In the modern world’s conundrum of hubbub and the loneliness of disconnection, membership in a CSA farm leads to a whole foods diet as well as knowing where and how your food is grown and the valuable feeling of connection to the land on which your food is grown. This website takes pride in maintaining directories of CSAs throughout the United States and Canada. And for those who already have a share in a CSA, a resolution to control the daily intake of sugar is a very fine resolution given momentum by the hard hitting documentary film, Fed Up narrated by Katie Couric. As a personal note, I’ve been conscious of keeping sugar consumption on a daily basis below 50 grams and it has resulted in better health and some weight loss. The current draft guidelines of the World Health Organization (WHO) point out that sugars should make up less than 10% of total energy intake (calories consumed) per day, which is equivalent to less than 50 grams (approximately 12 teaspoons) of sugar per day for an adult of normal Body Mass Index.